We have a range of walking holidays along the Thames path, from a 3 day short break to a 17 day walk and anything in between. The walk starts at the source in Kemble and ends at Richmond upon Thames, just outside central London. We have divided the route into three sections so you can complete the route over a few holidays if you don’t have the time to walk it in one go. The Thames starts as a small trickle just outside Kemble. You will see the river grow and change as the walk progresses. Watch the herons, ducks and swans as the river flows by, and see the many rowers and pleasure boats at Windsor, Eton and Henley. 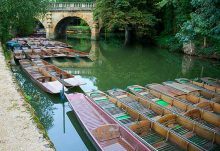 You can add rest days to allow you to explore Oxford and Windsor Castle, or add a day at the end to visit Kew Botanical Gardens. Click on the links below to have a look at the details for each Thames Path walking holiday. 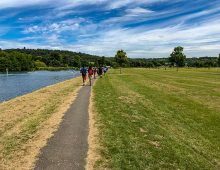 We offer three options covering the Thames Path from source to Richmond-upon-Thames. The 10 day option has a few longer days and is great for experienced walkers with a good level of fitness. The 12 day walk is a suitable option for most regular walkers, the daily distances allow you the time to look around the towns along the way and enjoy the views. Finally the 17 day walk is for those with plenty of time who want to savour the countryside and complete the route at a gentle pace. Please bear in mind that the distances each day are trail distances only. They do not take into account walking to your accommodation. On some days the accommodation might be on or close to the trail but on other days you may need to walk one or two miles to get to your overnight stop. We offer two options on the first part of the walk: 4 or 5 days walking. The 4 day option has one longer day of 17 miles. The 5 day walk avoids the long day by splitting the day between Tadpole Bridge and Oxford into two. We offer a 4 and a 6 day walk on the central section of the Thames Path starting in Oxford and finishing in Marlow. The 4 day option has an 18 mile day so you need to have a good level of fitness to complete this walk. The 6 day option takes it easier to allow you the time to enjoy the river and the historic towns along the way. There are two options on the eastern part of the Thames Path. Choose between 3 days walking and 5 days walking. 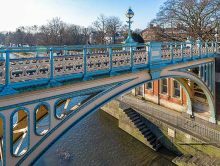 Starting in Marlow and finishing in Richmond upon Thames, with Eton and Windsor in the middle, there is plenty to see and do on this part of the walk. 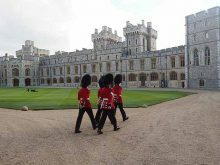 You might consider adding a rest day in Windsor to look around Windsor Castle, or one at the end in Richmond to allow you the time to visit the nearby Kew Botanical Gardens.